Rio Tinto - "We are one of the world's major producers of thermal coal, used for electricity generation in power stations, and of coking coal for steel making." HSBC Custody Nominees (Australia) Limited - Rio Tinto's largest shareholder with 19.45 percent of the issued share capital "...is listed as the number one shareholder for all of the Big Four Banks in Australia. It is a wholly owned subsidiary of HSBC Holdings Plc - You Know... HSBC BANK - Yes, that's right... HSBC Bank owns more than 10 percent of all of the big Four." ASHLEY HALL: The former banker and [Rio Tinto] mining executive, John Ralph, is warning that the Government's proposed mining super profits tax will cut industry investment and risk national sovereignty. Mr Ralph oversaw business tax reform for the Howard government. He's now retired from corporate life, but he says he's re-entered public debate reluctantly because of the damage he believes the Government is about to inflict on the Australian community with its planned resource tax. John Ralph was formerly CEO of CRA Ltd [in 1997 CRA Ltd became Rio Tinto Ltd], Chairman of the Commonwealth Bank and Deputy Chairman of Telstra. He is a Catholic layman active in Church organisations. 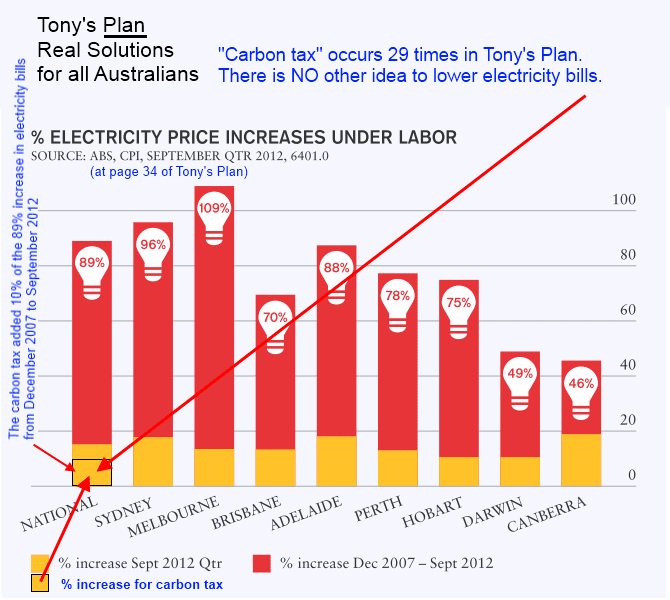 Australians see the ALP / Greens carbon tax just that, another tax. Carbon in itself is not a pollutant. The Australian legislation is based on antiquated ignorant and plainly stupid ideology that has no part in today's world. All these polluting countries are laughing at Australia but it is boom time for Green Capitalist for derivative trading where the world’s greatest polluters are the winners. "There is no reason for developing countries to burden themselves with out-dated power generation technology that is a great handicap to developed countries." According to the IEA report, developing nations will largely drive future coal growth. China and India combined are expected to account for more than 90 percent of the increase in global coal use over the next five years. The bad news is that the coal industry is attempting to foist antiquated and obsolete technology for coal-fired power stations on the developing world. This is an unscrupulous marketing strategy. It mirrors the conduct of Canada in banning the use of asbestos in Canada because of serious health risks and then continuing to export asbestos along with asbestos-related disease and health costs to India. In the run up to this congress, pollution has been a major issue for everyday Chinese citizens. The issue is NOT the use of coal by developing countries. The unscrupulous conduct of developed countries is the construction of coal-fired power stations in developing countries. These lock the developing countries into reliance on inefficient and expensive uses of coal. 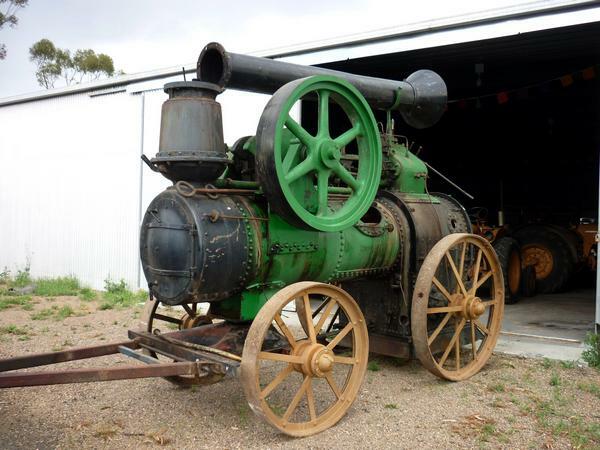 This old power generating technology uses coal very inefficiently. The result is that the costs of power will be unreasonably high. 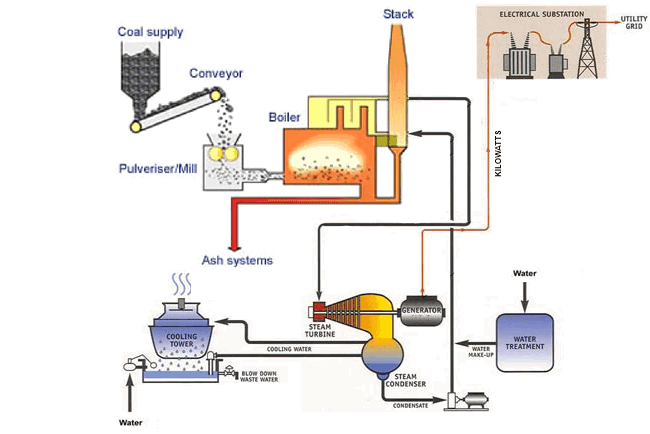 In the event that carbon capture and storage technology is eventually required and is installed this will further reduce the efficiency of coal-fired power stations, increase the cost of electricity in developing countries, and increase demand for coal exports from developed countries including Australia and the USA. Developing countries are in the advantageous position of being able to skip one generation of inefficient, out-dated power generation technology and move directly to new high-efficiency, cleaner and cheaper power generation technology. 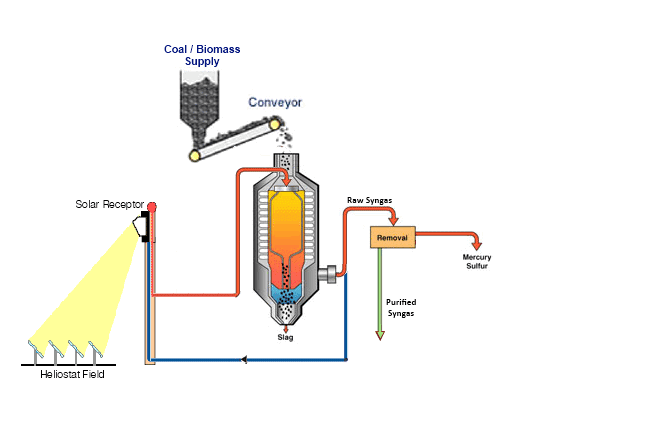 The first step is to convert coal to natural gas, synthesis gas or hydrogen. 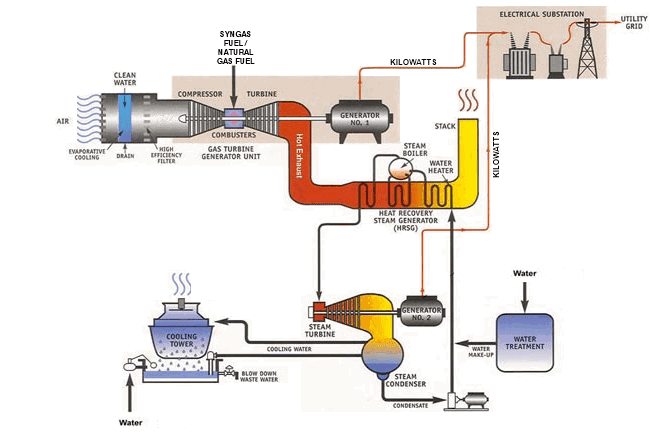 for synthetic natural gas - combined cycle gas turbine ("CCGT") power stations for centralised power generation and combined heat and power power stations for distributed co-generation and tri-generation applications. As concerns about CO2 emissions grow, coal-fired power plants are increasingly being replaced with cleaner energy – and new GE technology is aiding the transition. The FlexEfficiency 60 Plant is the most flexible and efficient power plant of its kind, capable of reaching greater than 61 percent thermal efficiency in combined cycle. Six of the larger 7F 7-series gas turbines will be shipped to the Chubu Electric Power plant in Japan. Capable of reaching a world’s best 62 percent thermal efficiency, the plant will produce more than 2,300 megawatts in combined-cycle operation. In November 2007, Duke Energy received approval from the Indiana Utility Regulatory Commission to build a cleaner-coal integrated gasification combined cycle (IGCC) plant at Duke Energy’s former 160-megawatt Edwardsport Station in Knox County, Indiana. The 618-megawatt IGCC facility will be one of the cleanest and most efficient coal-fired power plants in the world. It will emit less sulfur dioxide, nitrogen oxides and particulates than the plant it replaces – while providing more than 10 times the electric power. Coal is one of the most practical alternatives for addressing Duke Energy’s additional baseload power needs in Indiana. Building the Edwardsport IGCC plant ensures that Duke Energy customers in Indiana will continue to have fairly priced, reliable energy that will help our economy grow. The project is expected to begin commercial operations by early 2013. These convert the available energy in gas fuels-sourced from coal, biomass and natural gas-to useful energy with an efficiency from 60 to 98 percent. 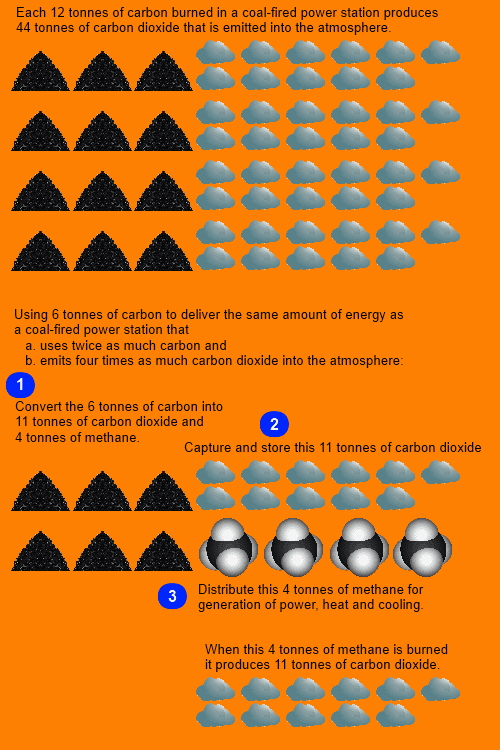 Coal-fired power stations can achieve only a fraction of this efficiency. 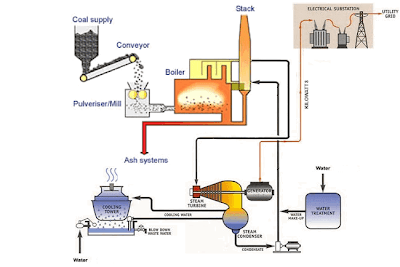 Add carbon capture and storage equipment to coal-fired power stations and their already bad performance becomes woeful. There is no reason for developing countries to burden themselves with the out-dated power generation technology that is a great handicap to developed countries. "We Are Going to the Moon - Let us Resolve to Climb a Nearby Hill"
A common response to warnings of climate change is the pursuit of domestic policies that are inadequate. Australian and U.S. coal exports for instance have rapidly expanded to take up the surplus production that has resulted from cut-backs in domestic consumption.This interplay of vested interests and economic forces is easily overwhelming any benefits of national policies to cut emissions. A considerable amount of energy also is going into an unnecessary argument over climate science. The pursuit of low-emission technology is all that is needed. The opponents of climate science are not only dogmatic in denying the possibility of human-induced climate change. 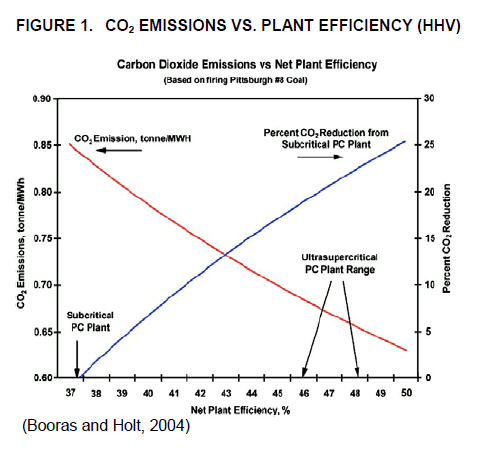 They are equally dogmatic with irrational claims that innovation to curb carbon dioxide emissions is not possible or, at the very least, is not economically feasible. The argument about this irrational claim is the only one that need be pursued. Some ideas for this argument are in the post: China slashing carbon dioxide emissions. In the mid-1960s a great many self-proclaimed pundits argued passionately that it was impossible for man to go to the moon. No amount of rational argument could sway these dunderheads. There was exactly one, very simple answer. With the First Moon Landing by Apollo 11 on July 20, 1969 the loud naysayers went suddenly quiet and were never heard from again. 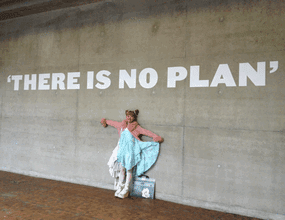 ...climate change 'has little to do with the state of the environment and much to do with shackling capitalism and transforming the American way of life in the interests of global wealth redistribution.' "
The Texas deal applies a tried-and-true Chinese model: providing competitive financing through a state-owned bank…then negotiating participation for other state-owned companies. 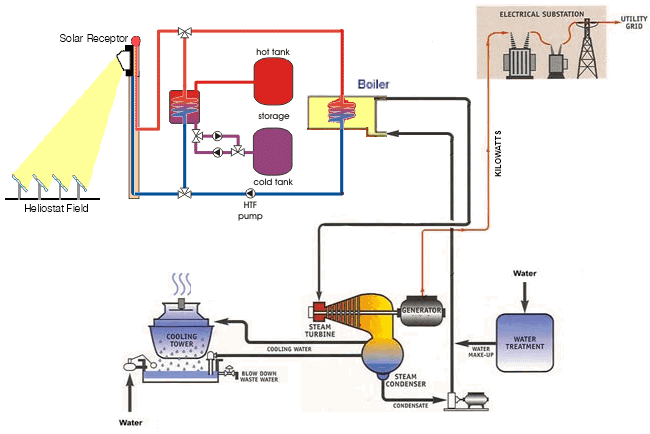 Synthesis Energy Systems of Houston which holds a license for a coal gasification process that upgrades efficiency of low-quality coals while reducing toxic emissions, recently got an $84 million investment from Zhongjixuan Investment Management ( ZJX) of Beijing in exchange for 43 percent ownership in the company. Synthesis President Robert W. Rigdon has admitted awareness of the history of Chinese companies use of foreign technology without regard to patents ..."
It is a waste of time and energy to discuss climate science with such ideologues. Beyond Zero Emissions in Australia provides an example of setting sights on a nearby national goal that is too trivial for the problem that is to be solved on a global scale. If you intend to go to the moon, walking to the top of a conveniently nearby hill will not get you closer to your goal. Australia's carbon dioxide emissions per capita are among the highest in the world. Every person in Australia is part of a domestic economy that emits about 18-19 tonnes of carbon dioxide on behalf of each of them. Reducing emissions to zero - in Australia - is the goal set by Beyond Zero Emissions. In the last 3 years Australia greatly reduced its domestic consumption of coal. Over the same period it increased its exports of coal by a greater quantity. As the largest coal exporter in the world Australia's contribution to global carbon dioxide emissions is staggering. Every person in Australia is part of a domestic economy that exports about 30 tonnes of coal on behalf of each of them. When burned this coal creates about 100 tonnes of carbon dioxide emissions per person in Australia. This is more than 5 times the emissions of each Australian in the domestic economy. This figure of 30 tonnes of coal exported per Australian a year is now about 3 times greater than it was just 5 years ago. The U.S. situation reflects similar dynamics. Record U.S. shale gas production has lowered the cost of energy and the intensity carbon dioxide emissions of U.S. electricity generation by displacing coal-fired power generation. While coal's contribution to power generation in the U.S. has undergone an unprecedented decline, falling to the lowest share of net generation since 1973, U.S. coal exports are about to exceed the record set by the U.S. for coal exports in 1981. Regulations requiring cleaner emissions from coal-fired power stations in the U.S. display the same perverse consequences. In 2008 major U.S. banks set guidelines on financing 'dirty' coal power plants taking into account foreshadowed regulations to limit emissions. The media report describing this historic initiative by major U.S. banks failed to observe that the banks never intended these guidelines were to apply to financing coal power plants outside the U.S.
"World Resources Institute identifies 1,200 coal power plants in planning across 59 countries, with about three-quarters in China and India. ...New coal power plants have largely been financed by both commercial banks and development banks. JP Morgan Chase has provided more than $16.5bn for new coal plants over the past six years, followed by Citi ($13.8bn). Barclays ($11.5bn) comes in as the fifth biggest coal backer and the Royal Bank of Scotland ($10.9bn) as the seventh. The Japan Bank for International Co-operation was the biggest development bank ($8.1bn), with the World Bank ($5.3bn) second." That has made coal exports, which have increased this year in every region of the country except the West, according to federal figures, even more crucial to the industry than they were when the six terminals on the Pacific Coast were first proposed. Jason Hayes, a spokesman for the American Coal Council, said that with coal-producing nations like Australia and Indonesia competing for Asian markets, a roadblock on the West Coast is an issue for the entire American economy. " "The pressure to send more coal on trains through British Columbia's Lower Mainland is coming because the U.S. coal industry needs to tap new markets in Asia but has run into serious opposition in northwestern states. Eric de Place, a researcher with the Seattle-based Sightline Institute, said six large coal export terminals have been proposed in Washington or Oregon but activist opposition has already killed one of them. "There's something like an insurrection going on in Oregon and Washington," he said. "People are extremely angry." The world's biggest coal producers are in the eastern U.S., de Place said, while the biggest consumers are in Asia. "The road between those two goes through Washington and British Columbia," he said, noting domestic U.S. coal demand has sagged as U.S. buyers shift to cleaner energy sources." "Wanxiang believes that GreatPoint Energy’s Bluegas technology is currently the world’s most advanced, lowest cost and most environmentally friendly technology for transforming coal into natural gas." The Bluegas hydromethanation technology developed and owned by GreatPoint Energy directly converts coal into pipeline quality natural gas, the cleanest commercial fuel in use globally. GreatPoint Energy’s proprietary technology operates at the highest efficiency with the least environmental impact, and produces natural gas at the lowest cost in the industry. 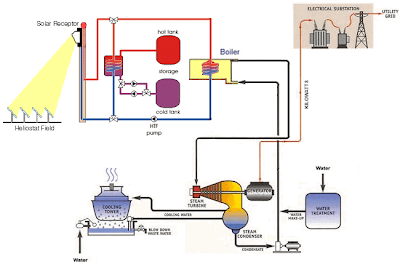 Inherent in the technology is the ability to capture nearly all emissions, including carbon dioxide, which can be sequestered and used for oil production through Enhanced Oil Recovery. The technology is especially well suited for arid regions and where low-quality, concentrated coal resources are available, such as in Xinjiang. Together, Wanxiang and GreatPoint Energy also plan to develop large-scale Bluegas projects at other locations in Xinjiang and in other regions of China using the Bluegas technology. Carbon Training International Case study on Australia’s Castle Hill RSL Club’s cogeneration system. A Tri Generation system reduces Rooty Hill RSL's carbon emissions by more than 50 percent. GE and its manufacturing partner, Nanjing Turbine & Electric Machinery (NTC) agreed to supply two gas turbines to Guodian Dianli's Nanxun industrial cogeneration power plant in China's Nanxun development zone. Guodian Dianli is a Chinese power company. China Guodian Corporation is a state owned enterprise which is among the nation's five largest producers of electricity. The new combined-cycle plant, which will generate to provide electricity and industrial heating for the Nanxun development zone, uses natural gas from China's West to East Pipeline II. Both turbines will be shipped by December 2013 and the plant will begin operation in the second quarter of 2014.